Slips and falls happen. Sometimes, they occur because the person who falls is being careless. However, other times, it is because the property owner has not sufficiently warned or dealt with a hazard on the premises and the hazard causes the slip and fall. In the former scenario, those who slip and fall generally do not have a legal claim from which they can recover monetary damages for their injuries. In the latter scenario, those who slip and fall will likely have a valid legal claim to recover monetary damages against the property owner if they prove certain aspects of their case. This article discusses the ways in which plaintiffs who slip and fall in a store can prove that store owners, the property owner, are legally liable for their resultant injuries. Generally, if people slip and fall in a store and suffer injuries as a result, the legal claim that they may assert against the store owner is a premises liability claim. Premises liability claims are based in negligence. This means that, in order to prove a premises liability claim, people asserting the claim must prove that: (1) that there was an unsafe or defective condition on the premises; (2) that the store owner knew or should have known of the unsafe or defective condition; (3) that the unsafe or defective condition caused the slip and fall; and (4) that the person who slipped and fell suffered injury as a result. 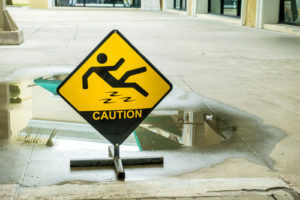 In order to prove premises liability claims, there are many pieces of evidence that one can use to establish that the store is at-fault for the slip and fall. For instance, stores typically have security cameras placed throughout the store. Accordingly, if someone slips and falls in a store, they can use this footage to establish the elements of a premises liability claim. This footage may show that there was a liquid substance on the floor of the store that the store’s employees failed to clean up or warn patrons of in a timely manner. If the footage then shows that the patron slipped and fell because he or she stepped on the liquid substance, this footage may be enough to prove that the store owner is liable for the patron’s resultant injuries. In other instances, there may be footage of an incident that has since been destroyed by the store owner. If the person who slips and falls can establish through the testimony of security workers at the store or of an expert witness in computer forensics that the store owner intentionally deleted the footage, this fact may be used to prove liability in a premises liability claim. This is so because this fact makes it appear as though the store knew it was liable for the incident, and tried to cover up evidence of that fact by deleting or destroyed the video footage of the slip and fall. Still, in other cases, using statements from store employees about the stores cleaning and safety check procedures as well as other patrons’ statements may be enough to prove a store owner’s liability for a slip and fall. These statements can establish that the store had inadequate cleaning and safety check procedures which led to the patron to come in contact with an unsafe or defective condition and slip and fall. To prove that actual injury resulted from the slip and fall, the person may submit medical bills, treatment plans and diagnoses, and other expenses. Submitting these documents enables the trier of fact to determine how much, if any, monetary damages should be awarded to the injured person. Did you or a loved one sustain serious injuries due to a slip and fall in New Jersey? Don’t let the medical bills pile up while you wait for the negligent party or their insurance company to do the right thing. Right now, you need an aggressive personal injury attorney on your side, fighting to get you the compensation you need, want, and deserve. The skilled attorneys at Hoyt & Hoyt, PC represent clients injured because of slips and falls in Morris Township, New Brunswick, Newton, Mount Olive Township, and throughout New Jersey. Contact us at (973) 292-2299 or email us to schedule a free consultation about your case. We have an office conveniently located at 67 East Park Place, 5th Floor, Morristown, NJ 07960, as well as an office in New Brunswick.